Washington (Agenzia Fides) - Yesterday the American President Donald Trump, signed the Iraq and Syria Genocide Relief and Accountability Act of 2018. The law, which defines as Genocide crimes perpetrated in recent years by Jihadists on Christians and Yazidis in Iraq and Syria, commits the US government to supplying aid to victims of violence and pursuing those responsible for such crimes. Among those present for the ceremony for the signing by the US President, Chaldean Catholic Archbishop Erbil Bashar Warda, Carl Anderson supreme Knight of the Knights of Columbus, US Ambassador to the Holy See Callista Gingrich and Archbishop Timothy Broglio, Military Ordinary of the United States of America. The law increases US financial assistance for humanitarian projects, aimed at stabilising and rebuilding in favour of religious minorities in Iraq and in Syria. It ensures that U.S. aid may come through federal government or other entities, including faith-based groups. It also enables the State Department, in collaboration with other federal agencies, to conduct criminal investigations and apprehend individuals identified as alleged ISIS members, and to identify warning signs of genocide and threats of persecution. Aid may also come through channels and bodies that refer directly to the federal government or also through the mediation of other bodies including those of ecclesial and religious nature. Moreover the act allows the US State Department to conduct penal investigations and aprehend individuals identified as presumed members of groups of Jihadist matrix, to punish or prevent violent actions towards religious minorities. President Trump himself, after signing the new law, confirmed US commitment to carry out procedures which commit US apparatus to pursuing those responsible for the crimes. The US House of Representatives, 27 September last, unanimously approved the HR 390 bill. Previously unanimous support had also come from the US Senate. 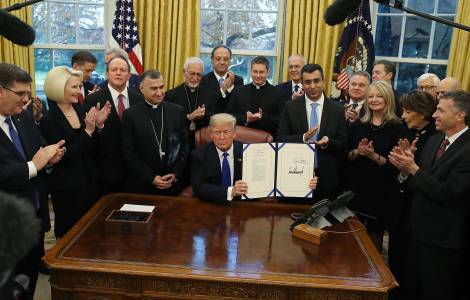 The signing of the law by President Trump is the result of lobbying already under the precedent Administration by US organisations such as the Knights of Columbus, In Defense of Christians, Family Research Council, Commission for Ethics and Religious Freedom of the Southern Baptist Convention, Initiative Wilberforce of the 21st century, Centre for Religious Freedom Centre - Hudson Institute. On the occasion of the signing, the US media re-proposed words related in the past to US representative Chris Smith, by the Chaldean Archbishop Bashar Warda, "Christians in Iraq are still on the edge of extinction, and the HR 390 is vital for our survival. Its implementation must be complete and swift, otherwise the help it brings will come too late for us". USCIRF, United States Commission on International Religious Freedom, a federal independent and bipartisan institute of Congress, praised President Trump for signing the bill. "In this bill we recognise the message that those responsible for these crimes, including genocide, will not escape justice ", said Kristina Arriaga USCIRF vice president,. The legislative move, consenting groups motivated by religious beliefs to receive financial help on the part of the United States, partly modifies the previous policy of the State Department and the US Agency for International Development, which for distribution used mainly United Nations channels – considered “neutral” from the religious point of view. On 25 October 2017, US Vice President Mike Pence had preannounced this change in procedures used by US policy concerning funding for humanitarian emergencies (see Fides 27/11/2017). "We will no longer rely only on the United Nations organisation to assist persecuted Christians and minority communities” Pence said on occasion of the Christians in the Middle East Benefit Dinner, organised in Washington by the American organisation In Defense of Christians. The US vice President in that context, preannounced that US federal agencies would work "side by side with faith groups and private organisations to help people persecuted for their faith ". Earlier Chaldean Patriarch Louis Raphael Sako said in an interview “in recent years in the Middle East Christians have suffered because of injustices, violence and terrorism. But this happened also to their Muslim Iraqi brothers and sisters, and those of other religious beliefs. We must not separate Christians from the others because this only feeds a sectarian mentality”. (GV) (Agenzia Fides 12/12/2018).